Hey y'all! I'm Jen from Juanita's Cocina! I was so excited when Kayle contacted me and asked me to do a guest post for her while she's on vacation. I figure, since I wasn't invited to go along, this is the next best thing, right? 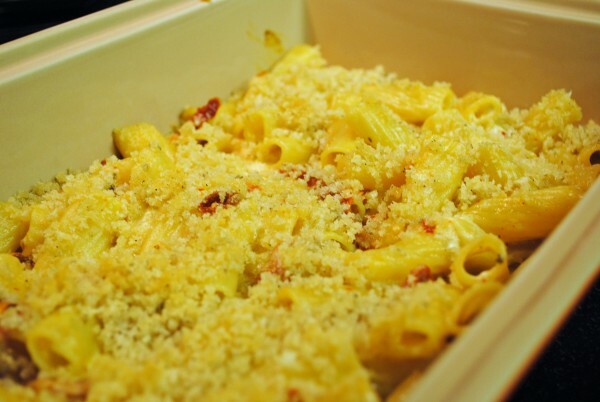 Kayle and I have become fast friends through food blogging, and I was thrilled to post a fabulous recipe for her! She is one of my favorite bloggers. Not only does she make yummy food, and not only is she super sweet, but we both sort of have an obsession with all things chicken. Do you think I'm joking? 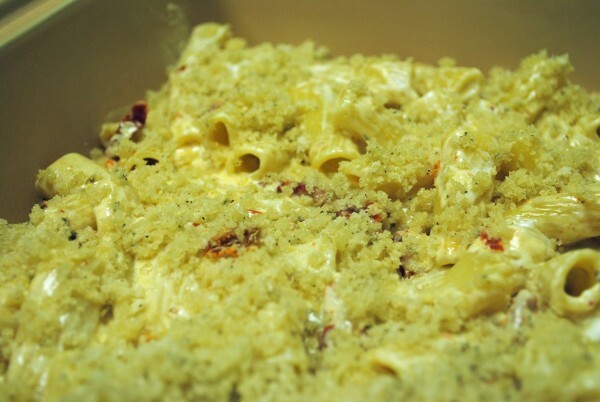 Just take a look at Kayle's recipe page and count how many chicken dishes she's made. Now take a look at my recipe page and count the chicken dishes. Part of me is sort of surprised that neither Kayle nor I cluck rather than speak to communicate! Clearly, this blogging relationship is meant to be! So as not to be predictable, when I was looking for a great dish to share for this guest post, I decided to settle on something WITHOUT chicken. (Shocker, I know...) But, I did want to focus on something quick, easy, and delicious. Kayle has a busy schedule (hello??? fabulous actress!) and so do I. And I really appreciate a dish that is delicious but doesn't take a year to prepare. 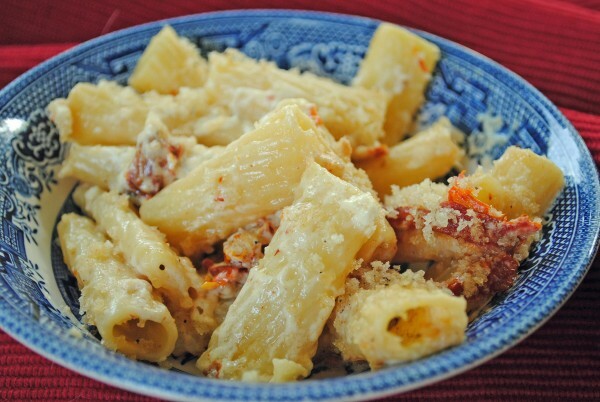 When I found this Sundried Tomato and Goat Cheese Rigatoni on Inspired Taste, I knew I had found the right dish! This pasta dish assembles quickly, but is AMAZINGLY delicious. If you're not a goat cheese fan, I still encourage you to try this dish. The sauce has just a *hint* of goat cheese flavor, but the cream (yum) and sundried tomatoes (oh yeah!) give the sauce a richer depth of flavor than just the tangy goat cheese has to offer. I hope Kayle is off having an amazing vacation! And I hope she thinks this dish is as yummy as my family did! And I hope she knows we've got everything covered while she's gone! Love ya', Kayle! Bring us all back souvenirs!!! While cooking the pasta according to package directions, heat the oven to 400 and grease a small baking pan with nonstick cooking spray. 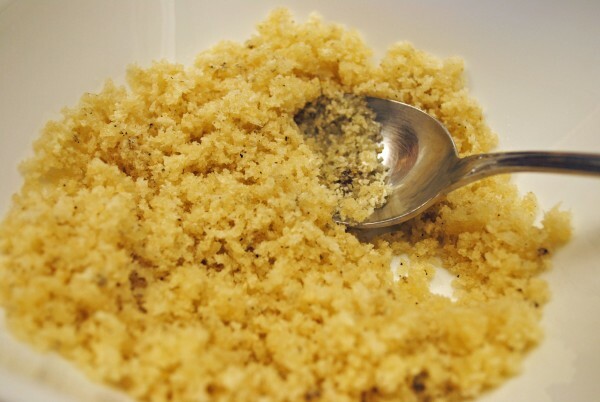 In a small bowl, mix the panko crumbs, 2 Tbs. of olive oil, and the pepper until well-combined. Set aside. Meanwhile, heat the remaining olive oil in a small saucepan over medium heat. Add the garlic, red pepper flakes, and sundried tomatoes, cooking for approximately 1 minute. 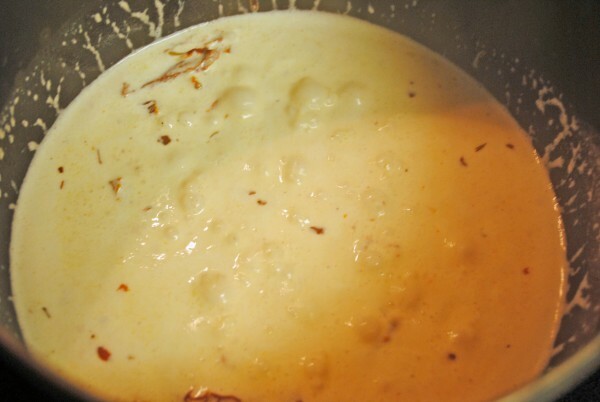 Add the heavy cream and nutmeg to the pot, allowing to simmer and thicken for 2 minutes. 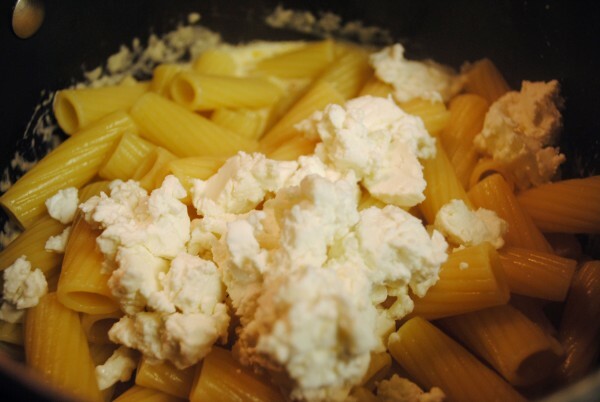 Once pasta is cooked and drained, add it and the goat cheese to the saucepan and mix well. Taste for seasoning and add salt as needed. Pour the pasta/sauce mixture into the prepared baking pan. Top evenly with the panko mixture. Bake for 10-12 minutes, or just until the panko has begun to turn golden and the cheese sauce is melted. Thanks so much for having me, Kayle! I hope that you take the time to drool over this amazing pasta for a bit even though you’re on vacation! And don't forget the vacation pictures!